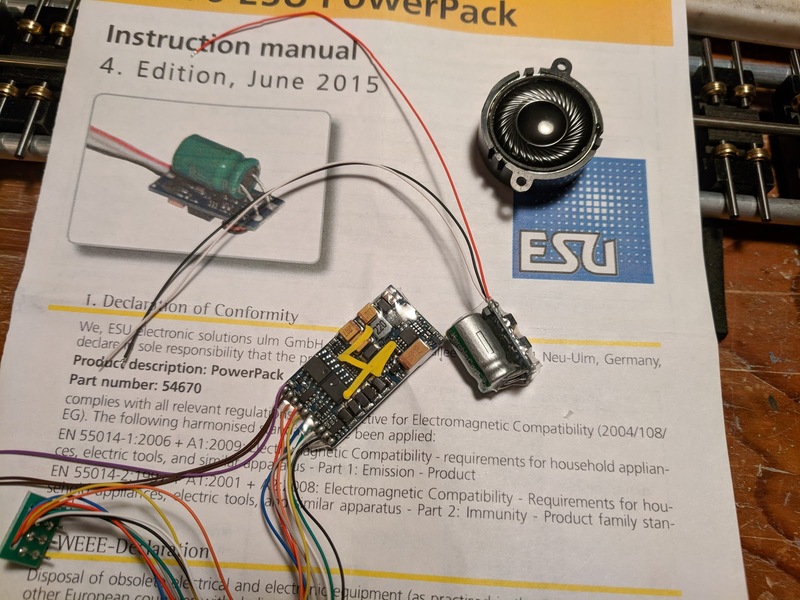 I hate soldering an ESU PowerPack to the Loksound 4 decoder. Given the circumstances, this is pretty well done with reasonably sized solder pads, but I really don't like soldering on a $100+ decoder board. 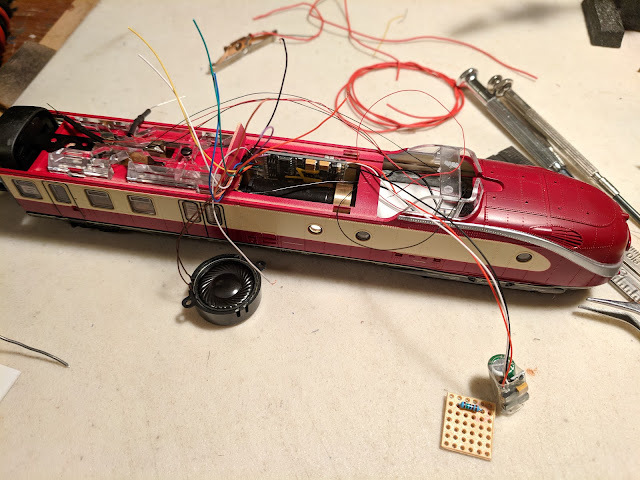 Once that was done and visually inspected, I connected speaker and a motor to the decoder and fired up the Mobile Station to double-check proper operation. Let capacitor charge for a couple minutes, fire up the speaker, disconnect the lead, aaaaaand ... urgh. Nothing. I verified the programming of CV 113, which controls how long the decoder pulls power from the capacitor. It was zero. Well, yeah, that's not going to work. Re-program to 150. Let charge. Try again, aaaaaand ... nothing. Urgh! Eventually, I turned to the Internet and found a hint that usage of AUX6 conflicts with usage of the PowerPack! That's ... unexpected. To make the Powerpack work, AUX6 needs to be disabled by setting CV 315 to 0. That worked great. On to the next try, the decoder sound continued to rumble along when I disconnected the power lead. On to the next step: Space planning. Even though the unit has quite a bit of volume inside the aerodynamic shell, options for speaker and decoder placement are very limited due to the motor, flywheel, transmission, and gears, combined with seating space in the rear half of the locomotive and my desire to have a partially furnished cab with engineer. I am planning to add cab lighting, too. Also, I want to keep the shell easily removable for service, so I can't have wires just go everywhere, otherwise it will be hard to get the shell back on. I decided to mount the decoder on styrene sheet under the cab. 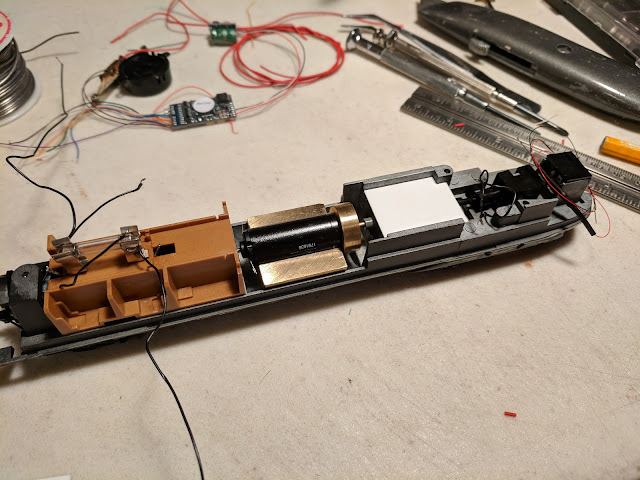 There is barely not enough space to put the decoder next to the motor and I need the space above the motor for the speaker. The PowerPack will go into a niche in the engine nose. To organize cable runs a little bit, I'm trying to route lights and power pickup to a circuit board that will be located near the motor, roughly where the decoder is on the photo below. 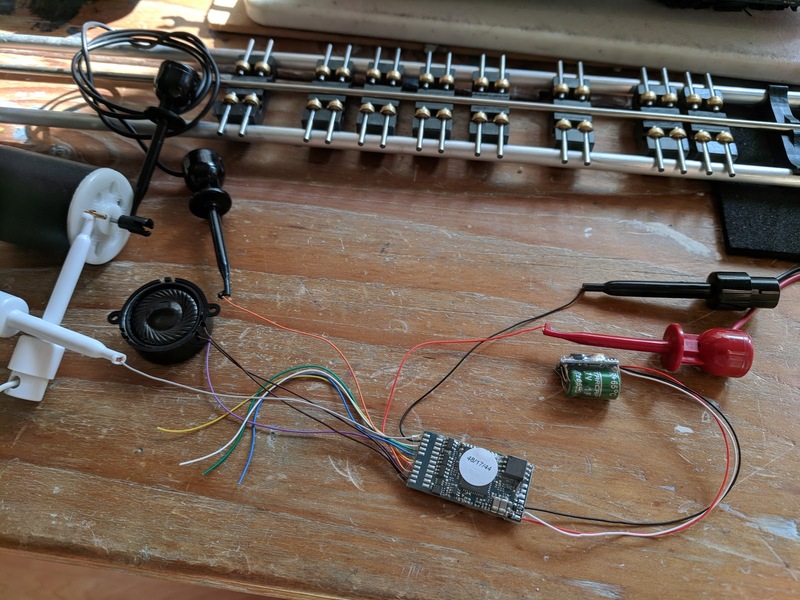 I temporarily connected the power pickups, programmed the motor parameters, and did a short test run on the bench.